Walking, laughing, getting know local merchants and tasting international beers! What a great way to spend an evening with friends. 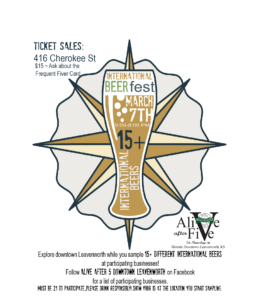 15+ merchants, retail and services, will be sampling some great beers from around the world. Paired with a tidbit to eat matching the Nationality of the beer! Good night all around! Tickets for sale at 416 Cherokee on March 1, 2019. Or online here! If you purchase on line you can pick up your ticket at Kansas Embroidery Co or dorMail Gallery.